Do you like chocolate and mint? 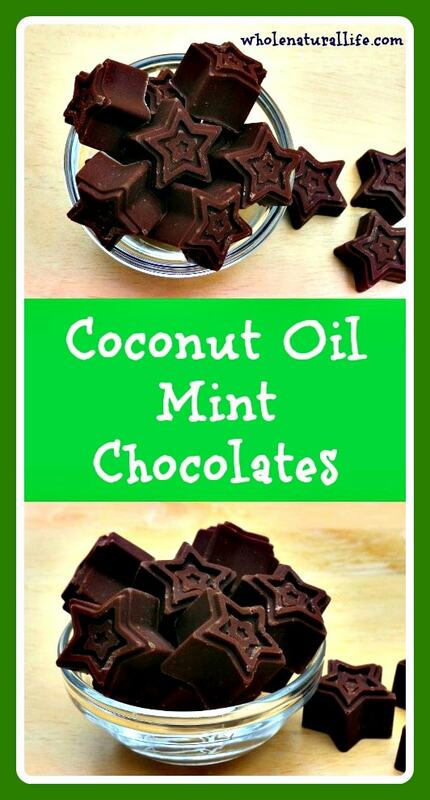 This homemade coconut oil mint chocolate recipe is delicious, and a great way to add some healthy coconut oil to your diet. I don’t think that these mint chocolates taste coconutty, but we eat a lot of coconut products here so my taste buds are probably dulled when it comes to coconut. If you don’t want your chocolates to have any coconut taste, just substitute refined coconut oil for the virgin coconut oil called for in the recipe. Blender: I highly recommend using a blender for this recipe. It makes mixing very simple, plus the extra power of the blender ensures that the honey emulsifies with the rest of the ingredients. I use this blender. Silicone chocolate molds: Silicone chocolate molds greatly simplify the process of making your own chocolates. I really like this set of chocolate molds, which is very economical but still high-quality, as far as I can tell. I’ve been making my own chocolates for years and have amassed a small collection of molds, which makes the process extra fun. 🙂 If you’re interested in making your own chocolates and other coconut oil treats, I highly recommend owning a few silicone molds. If you don’t have any molds, you can also just pour your chocolate mixture into a baking dish lined with parchment paper. The downside of this method is that the chocolates melt very quickly when you chop them into smaller pieces, so it’s a pretty messy process. Gently melt about half of your coconut oil on your stovetop. While the coconut oil is melting, add the other half of your oil and all other ingredients to your blender. Add the melted coconut oil once it's liquidy. Blend until all ingredients are evenly mixed. Pour chocolate mixture into molds. Put molds in the freezer until chocolates are firm, which generally takes about 20 or 30 minutes. When chocolates have hardened, pop them out of your molds and store in a lidded container in the freezer. Looking for More Coconut Oil Recipes? If you want more ways to get more coconut oil into your diet, you should check out my other coconut oil-rich recipes, like coconut berry delights, lemon coconut delights, coconut oil mints, and coconut oil fudge. Hi, what would be the purpose of leaving half of the coconut oil unmelted and melting half on the stove? Would it change the results if all of the oil was melted, or conversely, if all was left solid going into the blender? You definitely can't put it into the blender when all of it is solid--it won't be liquidy enough to blend properly. I suppose you could heat all of it if you wanted--doing half of it just means that it takes less time to warm up. These look amazing, and I'm excited to try them! One question: you say "cocoa" powder, but the link is for cacao. I'm assuming you mean cacao, since it is healthier, but there is a huge difference (but an easy typo!) so I wanted to clarify. Honestly I don't find any difference in taste between cacao powder and cocoa powder, so in the interest of not intimidating anyone with an unfamiliar ingredient I chose to list it as cocoa powder. I assume that people who are into cacao powder will just substitute it for the cocoa powder. You're right that the link is kind of confusing, though--I linked to that product because that's the one that I actually use myself. Maybe I need to update the recipe to specify that you can use one or the other. It is actually widely believed that the word cocoa has its origins in a spelling mistake (of the word cacao). A mistake which was never corrected, and perhaps found easier to pronounce, quite successfully overtook the correct form. Can you put these in mini muffin liners instead? I don't have a silicon mold. Also - how many does this make? I love chocolate mints. I have never tried these in muffin liners, so your guess is as good as mine. Give it a try and see how they do! As for the amount, it widely varies depending on how big you make each chocolate, so I guess it's really up to you. is there an easy way to print your recipes? Other than cut and paste to a word processor, no. I will look into that. I have a question. Whenever I try to make chocolates like this - with coconut oil and honey - my mixture seems to separate during the cooling process. My honey sinks to the bottom and the oil to the top. Even after processing in a vitamix. Any suggestions? Thanks! was wondering if you could start adding nutritional info on these recipes? ie carbs, calories etc per serving?? Thanks! I don't eat according to calories/carbs/etc., so I won't be adding nutritional info. But I'm sure you could easy look this info up yourself using the ingredients. I am not fond of the taste of coconut is there another oil you could use? As I wrote in the post, you can substitute expeller-pressed coconut oil. It has no coconut flavor but is nearly as good for you as virgin coconut oil. These chocs look fabulous shall make them for when i finish my 28 day juice detox with Jason Vale, started the detox on the 13th July, thank goodness i didn`t see this recipe 2 weeks ago. Feeling just amazing best thing i`ve done in a long time. Thanks, Lisa! I'm so glad you liked them. I love how easy they are, too. These are amazing! I just wanted to share that I put my mold in the freezer while I got everything ready and mixed the ingredients. Then I poured the chocolate in the molds and stuck them right back into the freezer. Since the mold was cold to begin with, the coconut oil started to solidify on the bottom first. The honey still separated, but it stayed in the middle of the chocolates giving them a liquid center. do you think this recipe would work without the mint to make homemade chocolate chips (for use in cookies, etc.)? Well, you can certainly take out the mint and play around with the other flavors to make homemade chocolate chips--but you don't want to put them in anything baked. Since these are made with coconut oil, they melt at about 76 degrees, so they will not stay together at all in the oven. How many of those candies does this recipe make if I use the same molds you do? I'm not sure--I didn't take note when I last made the recipe. Definitely! Just add your preferred sweetener to taste. They might be a little harder in texture, but that should still be fine. These are absolutely amazing! They are super easy, super healthy and super delicious! That is a true sign of great talent. Thank you Meghan. Aw, thank you, Judene! Easy, healthy and delicious is my goal every time. :) Nice to know you agree on this recipe. I really appreciate you sharing with me.